Winter weddings aren't as unconventional as they used to be. There is something about a winter wedding that is very romantic and magical. While the fluffy white snow is flying outside, a winter wedding gown with sleeves is just the thing to bring the season and your fairy tale wedding to life! 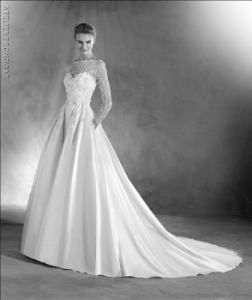 This Elmira ballgown by Atelier Pronovias twinkles like a snowflake with its satin material and sparkling gemstones. Our creative winter princess' gain the advantage of two glamourous looks by attaching and detaching the beautiful voluminous skirt. With the sweetheart neckline and delicate thin sleeves, this gown brings enchantment to the altar. This Madeleine trumpet gown by Ines Di Santo gives a winter wedding a whole new level of excitement with it's lace inset sleeves and gorgeous V-neckline that extends front to back. The comfortable stretch crepe fabric brings attention to the curves of a woman's body for classic, seductive elegance. This Gala 612 column gown by Gala- Galia Lahav brings an alluring, modern twist to the church. It features cut-out waist accents and a bejeweled belt that makes people forget it's cold outside! Even though the fabric is very lightweight for winter, you'll be thankful when the adrenaline is rushing through your body as you become that blushing bride! This Lis high-low gown by Alyne- Rita Vineries makes any bride glisten against the snow covered background. It features a body suit that pairs beautifully with this layered silk tulle skirt and silk satin ribbon at the waist. The delicate hand-beaded pearls on the sleeves and bodice create a vibrant glow that will be sure to catch your groom's eye. This L7174 strapless gown by Legends Romona Keveza pairs magnificiently with this three-quarter inch lace sleeve overblouse for a classic and romantic appearance. The illusion low back and trumpet train create an alluring shape for the bride to say "I Do" in. 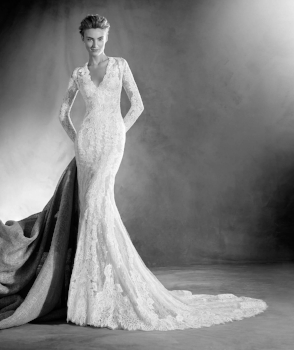 This Elva mermaid gown by Atelier Pronovias is an effortless and stunning option to "wow" the crowd. With its V-neckline tailored in silk tulle and Chantilly lace, it seduces the eye with its intricate, nature inspired design. Pearls stream down the back for a delicate and irrisistible creation. This Killian gown by Tulle New York is classic, modest, and has an open back that shows enough skin while still keeping you warm. The simplicity and clean lines prepares this stretch crepe canvas to become a masterpiece by accessorizing it with a decorative veil, head piece, and earrings for a dazzling bridal look. This 6833 mermaid gown by Liancarlo pairs perfectly with this detachable tulle overskirt for a soft and virtuous bridal look. Alencon lace graces the forearms as illusion tulle covers the rest of the arm and over the décolletage. The layers of fabric keeps the bride warm, while still being lightweight enough to wear all day. Having a winter wedding doesn't mean you have to leave style out in the cold! Long sleeve gowns include some of the prettiest, most romantic elements ever. Let us her you bring your winter fairy tale to life in Tampa Bay at Isabel O'Neil! Come shop our newest collections of long-sleeved gowns.